This advertisement was published shortly after the baths opened in 1908. These baths are often confused with the earlier ones built by David Urquhart's London & Provincial Turkish Baths Co Ltd and opened at No.76 Jermyn Street in 1862. The Savoy baths were designed to cater for a less exclusive clientele. Ernest Henry Adams opened the York House Hydro some time around 1908. Two years later he opened Turkish baths round the corner at 92 Jermyn Street. The two premises were joined at the back and the (Duke of) York Street baths were turned into Ladies' Turkish Baths. 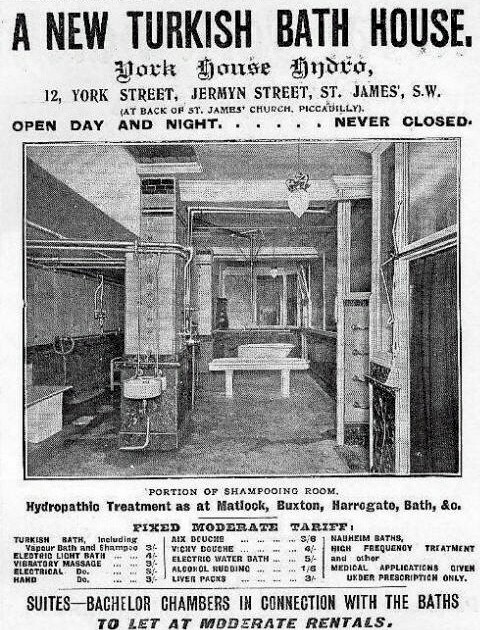 The men's baths in Jermyn Street were open all night, and soon became popular with the gay community. An article will appear on these baths at a later date.